Hello and welcome everyone to the 2nd weekly installment of "IDP Game Notes" brought to you by IDP Guru staff writer, David Larkin. 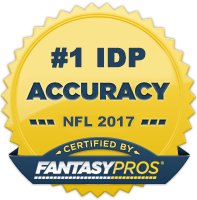 This column is quickly turning into one of the most comprehensive, all-encompassing IDP articles anywhere. And it's free! The Broncos lined up from the get go with LB Jason Hunter opposite the TE to create a pseudo five defensive linemen look, presumably to combat the threat of Frank Gore. As a result, linebackers D.J. Williams (9-0) and Mario Haggan (8-0) were very active, chasing down the ball carrier and making several nice plays. Haggan stood out and played with great intensity. Brian Dawkins (6-0) looked like his old self in his return from injury and delivered a vicious hit on Troy Smith which only went down as a quarterback hurry in the box score, but went down as a message to Smith on the play. Denver continued to employ a base 4-3 look, but failed to get much of a pass rush from the ends, Ryan McBean and Marcus Thomas. Denver showed some overload blitz concepts in this game as well. What more can be said about Patrick Willis? Willis (8-1) was simply everywhere in this game, rallying to the ball and making nice tackles time after time. Despite Taylor Mays (7-0) solid tackle numbers, he made a false step on a huge Brandon Lloyd completion, but credit has to go to him for chasing Lloyd down and making the tackle at the one yard line. Justin Smith (4-0-2.0) also played a terrific game and showed incredible strength on one his sacks when he split a double team and forced his way into the offensive backfield. Ahmad Brooks (2-0-1.0) continues to be rotated in as a DPR (designated pass rusher) and should be watched by dynasty owners. Derek Cox (5-1-2 INT) was the star of the Jaguars defense on this day as he picked off two passes, one off a drop from Miles Austin. He tackled well all game long. Courtney Greene (8-0) showed up in run support and his eight tackles are a testament to his gap discipline. Justin Durant (9-3) made the biggest impact in the box score, but fellow LB Daryl Smith (4-3) also made some nice tackles. Rookie Tyson Alualu (2-0-1.0) is proving to be a valuable player for the Jaguars defensive front and he may well be worth the 10th overall pick when it’s all said and done. Dallas did not perform very well defensively. Alan Ball (7-0), despite his strong box score, was responsible for biting too hard on play action which led to the first Jaguars touchdown near the goal line. The Cowboys rotated several young players in, including Victor Butler (1-0-1.0) who had a great sack on Garrard. Surprisingly, DeMarcus Ware (0-0) did not even appear in the box score and his pressure was sporadic at best. Dallas played with a lack of passion in this game. Benny Sapp (4-6) showed he is becoming more comfortable in the Dolphins defense as he made several good plays on Sunday, especially against the run. Yeremiah Bell (6-3) was his usual productive self and wasn’t afraid to stick his nose in against Cedric Benson’s physical downhill running style. Cameron Wake (1-2) had a down day but this was mainly due to the Bengals offensive line which kept Palmer protected all day. Morgan Trent (9-2-1 INT) didn’t disappoint the Bengals with his performance in relief of Jonathan Joseph. Trent matched up against the speedy Davone Bess and made several nice plays in space. If Joseph is out for any more games, Trent is a player to target as quarterbacks target him more often. Reggie Nelson (4-2) came in to replace Ndukwe in the secondary and did well. The pass rush of the Bengals couldn’t get going with the Dolphins offensive line playing really good football. One thing is quite obvious from this game – the scorekeeper at Arrowhead Stadium is very generous with assisted tackles, and that can only be good for IDP players. Buffalo came close to securing their first victory, and their defense actually played well enough for them to win. Paul Posluszny (11-7-0.5) is back to the form that made him such a highly touted prospect, although his numbers are slightly inflated due to the sheer number of rushing attempts that the Bills faced. Expect Poz’s numbers to keep up this pace as the Bills rush defense is suspect. Dwan Edwards (4-2) continues to rack up tackles since the Bills changed to a 4-3 defense. He is a reliable DE2 right now in my opinion. Kyle Williams, as the Guru mentioned in his waiver wire article, is also very much worth a consideration as a pickup. He plays hard for this defense and it shows up in the box score as well. Some of the tackle numbers have to be taken with a pinch of salt in this game as you consider that the game didn’t only go to overtime, but was only a second or two away from a tie! Tamba Hali (2-2-1.5) is playing lights out football right now, and while I don’t expect him to take on Shawne Merriman’s former nickname, he doesn’t need a nickname to be an impact player for this Chiefs defense. Brandon Flowers (5-1-FF) saw more targets this week as the Bills were unable to get their ground game going and had to pass more. Flowers is slowly turning into a legitimate shutdown corner and in a year or two we could be talking about him in the same sentence as Darrelle Revis. LaRon Landry (7-1) saw a lot of passes coming his way on Sunday as the Lions carved the Redskins defense to shreds with the Stafford to Johnson combination. Rocky McIntosh (7-2) is an unheralded but solid player for this Redskins team and he made several nice tackles in space. London Fletcher (3-1) didn’t have a good game in the box score, but he was active all over the field. DeAngelo Hall (4-2-INT) made a beautiful play for an interception in the left corner of the end zone on a deep ball intended for Calvin Johnson. Hall sprung into the air, showing his elite vertical leaping ability and made the catch like a receiver would. The Detroit Lions have assembled a formidable defensive front. Kyle Vanden Bosch (5-1-2.0-FF) looked like the KVB of old as he routinely terrorized the Redskins offensive line. On one of his sacks, Vanden Bosch was in a roaming role, standing up and wandering around the defensive front, allowing him to make his read on the weakness of the line and attack it. Ndamukong Suh (4-1-2.0) also made beating the Redskins line look like taking candy from a baby. Suh is truly a dominant interior force and played lights out. To top off the praising of the Lions front four, credit has to go to Cliff Avril (4-1-2.0). Many thought that he would never truly break out, but this game could be a sign of things to come. Avril hasn’t been very consistent this year so far, however, so don’t expect too much. While Carolina’s offense continues to struggle, the defense has been playing at a very high level for most of the season. After a subpar start, Richard Marshall (9-0) has come back with a vengeance to save owner’s bacon. Marshall’s tackles were mostly on short completions on out routes, but each time he showed what a solid tackler he is. James Anderson (8-0-1.0), despite playing on the strong side in the Panthers’ Cover 2 defense, had another big game. The Panthers used him to blitz a lot in this game, playing to his strengths of speed and power as a linebacker. Jon Beason (4-0) continues to look miscast at the weakside linebacker position and admitted post-game that he missed Thomas Davis’ impact on the team. I bet he misses being at the middle linebacker position even more. Charles Godfrey (2-0) had an uncharacteristic down day as the Rams kept their passing game short mostly, but he was in on many plays and made a beautiful tackle on a screen pass out wide. The Rams defense has greatly improved from last season. In this game, the Rams continued to throw pressure from all angles at the Panthers. Oshiomogho Atogwe (2-0-1.0-INT-2PBU) had a massive impact on the game from the FS position. He snuffed out a reverse by the Panthers in the first quarter, showing good pursuit and discipline. The defense’s standout player was undoubtedly James Laurinaitis (7-1-1.0-INT) who routinely made form tackles, knifing through the line of scrimmage on a hesitant Jonathan Stewart. His interception was as a result of a poor throw from Matt Moore, but credit has to go to Laurinaitis for being in the right place. Laurinaitis is the sparkplug of this defense. The Rams defensive ends Chris Long (2-0-1.0) and James Hall (4-0) played a big role in the pressure put on by the Rams although the box score doesn’t show it. The Packers put on what can only be described as a sterling defensive effort on Sunday. Desmond Bishop (10-0) looks like the free agent pickup of the season in IDP leagues as he continues his strong run of games. From what I saw, Bishop did not play in the nickel packages, making his ten solo tackles even more impressive. It was Brandon Chillar (2-0-1.0) and A.J. Hawk (3-2) playing in the nickel package for Green Bay and they did a good job in coverage for the most part. Hawk had a nice pass breakup when he buzzed underneath the receiver’s route across the middle and leaped to make the play. Tramon Williams (4-1-INT) impressed me a great deal with his play. When he wasn’t making tackles, his coverage was very sound. David Harris (8-1-1.0) and Bart Scott (6-1) set the tone early for the Jets, but the offense couldn’t catch the fever. Both linebackers are tremendous in space making tackles, and Harris in particular stood out on film for me in this game. The Jets defense actually played quite well on the day, but didn’t have many other IDP contributors despite the opportunity they had. William Hayes (2-0) continues his return from injury with a two solo effort; not exactly jumping off the page, but it is promising to see him back in the rotation after the preseason expectations that everyone had of him. Once again however, the Titans front four is hard to figure out. It’s like a slot machine trying to predict what outcome we will get from starting one of their ever-changing defensive linemen. Stephen Tulloch (4-4) came back down to earth this week after several weeks in the stratosphere, but don’t be discouraged. Tulloch actually played quite well, but fellow LB Gerald McRath (10-0) took away a lot of tackles. This performance was not a fluke. McRath looked like a really polished linebacker out there and should be closely monitored. Alterraun Verner (4-0) continues to start opposite Cortland Finnegan and his solid play should allow Verner to hold on to the job despite the return of Jason McCourty. Don’t get too excited about Eric Weddle (10-1). This is only the second time all season that he has gone over seven solo tackles. In reality, he has been rather inconsistent in the box score. His play on Sunday was quite solid, but for IDP purposes pick and choose your matchups carefully with him. Kevin Burnett continues to be more reliable at the ILB position for the Chargers, as Stephen Cooper has become almost exclusively a matchup play. I’m slightly wary of this team’s value for IDP owners, as most of their players are too up and down to trust. Jared Allen (3-1) was so close to getting a sack in this game, but it wasn’t to be. The consensus #1 defensive end coming into the 2010 season in IDP circles has been a disappointment thus far, his only saving grace coming from his tackle numbers. I advise everyone to remain patient with Allen, because he is playing hard and he is sometimes only a half second away from crushing a QB. 2nd round pick Chris Cook (3-0) continued to see time in nickel packages, but Cook still makes fundamental errors that are easily correctable. Once he gets his feet under him as a pro, I expect Cook to turn into a very solid Cover 2 cornerback. Chad Greenway (8-3) may be the most underrated linebacker in the league. He is the most dependable tackler on the team and makes plays every week. James Sanders (5-0) filled in well for the injured Pat Chung, who most people thought would be able to go this week. Rookie Devin McCourty (4-0-INT) made a nice play for his interception and showed great speed and patience to follow his blocks up the field for a big return. Brandon Spikes (5-2) continued to show why starting him in favorable, run-heavy matchups like this can be advantageous to owners who pick the right time to start him. Jerod Mayo (7-7) has been on a tear recently, with 42 solo tackles in the past four games. Mayo is a must start every week and he played a good game on Sunday to boot. Tampa Bay’s defense is starting to look, dare I say, like its 2002 unit. They’re scoring defensive touchdowns again for one. Aqib Talib (5-0-2 INT-TD) got into the endzone on a nice runback where he weaved between defenders for the score. This was Talib’s best game of the season unsurprisingly, so you need to keep your expectations for him in check. The LB corps of Geno Hayes (5-0-INT-TD) and Barrett Ruud (6-0-INT) each got an interception to their name on Sunday. It is encouraging that Hayes has returned to form in the past couple of games as the “best team in the NFC” start to believe that the playoffs are a real possibility. The Bucs defense played well on Sunday, and young safety Cody Grimm (4-4) stood out for me as a stout run defender. His pass coverage has been sloppy at times, but Grimm has the toughness of his daddy. Calais Campbell (3-3) keeps making plays for the Cardinals and boy is he an impressive physical specimen out there. His stock is rising. Kerry Rhodes (9-1) was busy as usual, taking on plenty of rushing attempts from the Bucs throughout the game. Gerald Hayes (3-2) returned from injury and got a touchdown on a fumble recovery. Hayes is back to being a three down linebacker as rookie Daryl Washington takes a seat for the veteran. Greg Toler (0-0) had a down week in more ways than one, as Mike Williams beat him on a long touchdown, but he had a back issue entering the game and should be fine going forward. Red Bryant suffered an injury in this contest which forced the Seahawks to place him on IR, which is a blow to the team as Bryant had been doing quite well for them. Colin Cole (4-0-1.0) is quietly becoming one of more disruptive DT’s in the NFL and should be a starter in DT required leagues. Lofa Tatupu (1-5) continues to play within himself if you ask me and shouldn’t be relied upon by owners as anything more than a LB3/LB4. The Raiders defense just pummeled the Seahawks and Matt Hasselbeck on Sunday. The defensive front of the Raiders was simply unblockable – they weren’t the ’85 Bears out there, but they were close. Rolando McClain (3-2) keeps underperforming for owners who spent a first round rookie pick on him. I watched him play in this one and to be honest, he didn’t play badly. The Raiders front was simply getting so much pressure that he never had to make many tackles. I have a sneaky feeling that we could see McClain have a big game next week against Kansas City. Just a feeling. The Steelers defense came to play in the Superdome. Lawrence Timmons (11-1) is having a magnificent season. His sideline to sideline speed and above average football instincts combine to create a monster that ballcarriers do not want to have any part of. Bryant McFadden’s strong outing (7-0-1.0-FF) came as a surprise, but Brees targeted him often.. James Harrison (4-1-1.0) had a quiet game by his standards, but he made an impact by creating pressure and hurrying Brees’ throws especially in the early part of the game. Welcome back, Jonathan Vilma! Vilma (6-2-1.0) must have taken all that criticism to heart, because this is the first game that he has registered a solo tackle since Week 5. It’s hard to believe for such a talented player, but to be fair to him he played very well in this game, sticking his nose in where it hurt and making plays for his team. The Saints had a minor emergency at defensive back when CB Patrick Robinson went down early, giving Leigh Torrence (5-0-INT) the opportunity to play. The Saints are lacking consistent IDPs at the moment, so I would consider most of their players matchup based starts. Zac Diles (10-1) continues to deliver for those who remained patient with him. Diles and Cushing played almost exclusively against the Colts “11” personnel with three wide receivers. Diles was very quick to read, react and make the tackle on running plays against a very tough compact runner in Mike Hart. New boy Mark Anderson (3-1-1.0) made an impact as a rotational pass rusher and had a sack on Peyton Manning during which he completely overpowered the offensive tackle, showing great lower body strength to make the play. Mario Williams (1-0) had a disappointing display as he was at times rotated out of the game and seemed to be frustrated on the sideline. Williams was largely kept under wraps when he was out there by Colts LT Charlie Johnson, and sometimes Johnson didn’t even require help. FS Eugene Wilson (4-0) made several nice breaks on passes down the sideline as well. IDP owners have to like what they see from WLB Clint Session (8-0-1.0). This is his third consecutive game with at least eight total tackles. Session is always in and around the action and plays with a reckless abandon. He is perfect for the Colts predominantly Tampa 2 defense which “spills” the ball carrier to the weakside for him to tidy up. Dwight Freeney (2-0-2.0) and Robert Mathis (3-0) are simply impossible to stop when they get a jump on an offensive tackle. Freeney was particularly impressive as he used a well-executed spin move to completely evade LT Duane Brown early in the game and get a huge sack on Schaub. Gary Brackett (7-2) remains a consistent IDP option at linebacker and although he didn’t stand out as much as Session did, he played well. If you have any questions for David, feel free to email him at davidlarkin@idpguru.com or follow him on Twitter. Also, feel free to post any questions or comments for David in the comments section of this post.